The Sun as a Time-Keeper. Because the Earth’s orbital motion is not uniform, there are corresponding variations in the apparent speed of the Sun as it travels round the earth. For this reason, the true Sun (the Sun that we see in the sky) does not give an accurate measurement of time and to overcome this problem, the Mean Sun, as defined below, is used. The Mean Sun is an imaginary body which is assumed to move at a uniform speed round the Earth thereby giving a uniform progression of time. Solar Time. The true sun gives us apparent solar time while the mean sun gives us mean solar time. Example. An observation of the Sun is made at 11h 05m 22s GMT on 26August 2009. What is the apparent solar time? The Eqn. of Time on that date is -01m 55s. Eqn. of Time = mean solar time – apparent solar time. 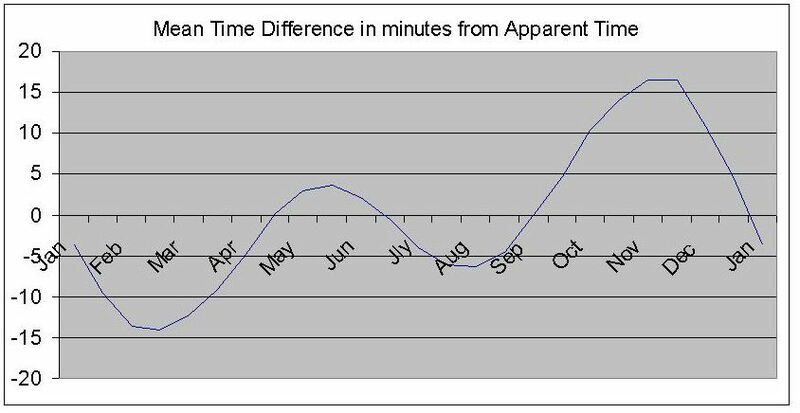 so apparent solar time = mean solar time – Eqn. of Time. The values are positive from 15th April to 14th June and from 1st September to 24thDecember. The values are negative from 15th June to 31st August and from 25th December to 14thApril. The following chart illustrates this information. Tables which accurately show the equation of time for each day of the year can be found in the various versions of the nautical almanac and also on the Internet. A comprehensive exposition of this subject can be found in the following book: Astro Navigation Demystified.